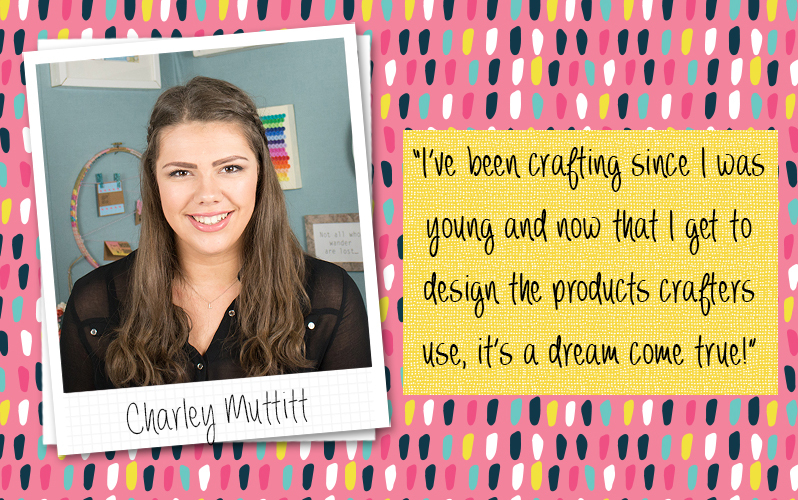 It’s time to meet talented Graphic Designer and avid crafter Charley! Find out which is her all time favourite papercraft collection is and what animal she has a serious soft spot for! I joined the team just before I graduated from University last July so have been at Trimcraft around 9 months now. I’m a Graphic Designer, I work on designing the crafty products that you see in the shops, along with the other members of the design team! Every day is different! One day I’ll be designing new paper pads, the next I might be working on some branding or putting together a presentation of a new collection. Although I have to say, the best days are the ones when it’s somebody’s birthday and there is cake in the kitchen! What's your favourite part of working within a team? It’s such a great feeling when we all come together to create something amazing. We bounce ideas of each other and all bring something different to the projects. My favourite Trimcraft product is the FE Paper pads, particularly Pick N’ Mix. I just love all of the fun, doodled patterns and the colour palette is so nice. Also, I’m a big fan of Jessica Hogarth and have followed her work for years! Honestly, my hobby has become my job! Not that that’s something to complain about but I still love to draw and create in my spare time! My boyfriend and I moved into our first home last year and I really love shopping for all things home interiors and making our house look pretty! If I’m not doing that I enjoy baking and cooking, and also spending time with my family and dog when I’m back home in Blackpool. What inspires you to craft? I think it’s always the paper pad that draws me in! When I see a paper that I really love, I start to visualise all of the other bits and pieces that I can add to it to create a project. There’s something really special about giving somebody a handmade card or gift, I’ve been crafting since I was really young so now that I get to design the products that other people use to create their projects it is like a dream come true! I would of course treat my family and friends! Aside from that, I’m not one for crazy holidays or anything like that, but I am absolutely dog mad and would use the money to open up a rescue home for all of the dogs who do not have one. I have been up to the top of Blackpool Tower more than a hundred times! I used to work there when I was a student and am certainly very well acquainted with the 69 second lift ride to the top, but the view never got boring! Hi my name is Irene, me & Hubby had our Honeymoon in Blackpool we have been up the Tower and took our children up to, but the Tallest building we have been up is the tallest one in the world ( The burn- khalifa) in Dubai. Hi there again, I see you love doing your job Graphic Designer, Our youngest son did that at first then went on to web Design, Now he is a webDesigner in London. Hi there, I have enjoyed reading your story very interesting, but did you know you have put your family photo up the wrong way round.